AS9100 will be familiar to our Aerospace and Defence readers as an aerospace standard based on the ISO 9001 quality system requirements. 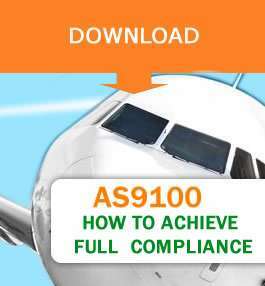 The latest version of AS9100 takes the ISO 9001:2015 requirements and supplements them with additional quality system requirements. To download the full AS9100 guide, click the download button in the column. To assure customer satisfaction, aviation, space, and defence organizations must provide, and continually improve, safe and reliable products and services that meet or exceed customer and applicable statutory and regulatory requirements. The globalisation of the industry and the resulting diversity of regional and national requirements and expectations have complicated this objective. Organizations have the challenge of purchasing products and services from suppliers throughout the world and at all levels of the supply chain. The Aerospace supply chain have the challenge of delivering products and services to multiple customers having varying quality requirements and expectations. Industry has established the International Aerospace Quality Group (IAQG), with representatives from aviation, space, and defence companies in the Americas, Asia/Pacific, and Europe, to implement initiatives that make significant improvements in quality and reductions in cost throughout the value stream. AS9100 standardises the quality management system requirements to the greatest extent possible and can be used at all levels of the supply chain by organisations around the world. If implemented effectively it should result in improved quality, cost, and delivery performance through the reduction or elimination of organisation-unique requirements, effective implementation of the quality management system, and wider application of good practice. While primarily developed for the aviation, space, and defence industry, this standard can also be used in other industry sectors when a quality management system with additional requirements over an ISO 9001 system is needed. S A Partners use the expertise of our consulting team to assess your requirements against the Enterprise Excellence Model – building a roadmap for improvement to achieve AS9100 Certification. The authors of this article are Robin Jaques, Sector Head at S A Partners for the Aerospace & Defence Sector, and Leigh Rogers, part of our expert consulting team specialising in the application of Lean and Continuous Improvement approaches in the Aerospace & Defence sector. To view the full white paper, use the green download button.